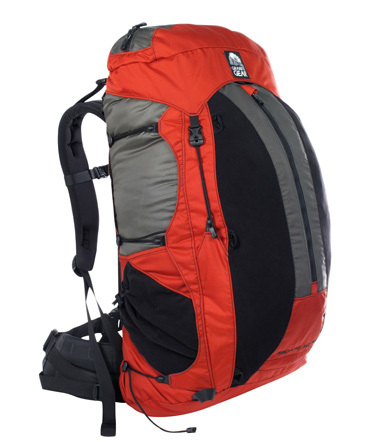 One thing most backpackers have to concede – we’re gear junkies. We can’t imagine going on the (road) trail without a few of our favorite things. There’s nothing wrong with that. It’s fun to peruse the latest and greatest gear sites and catalogs, dreaming of how much better our next trip would be IF ONLY we had that piece of gear we’ve been drooling over. With that thought in mind I thought I might suggest a few things (based on my experiences) to might make your Christmas shopping (or catalog browsing) season brighter. 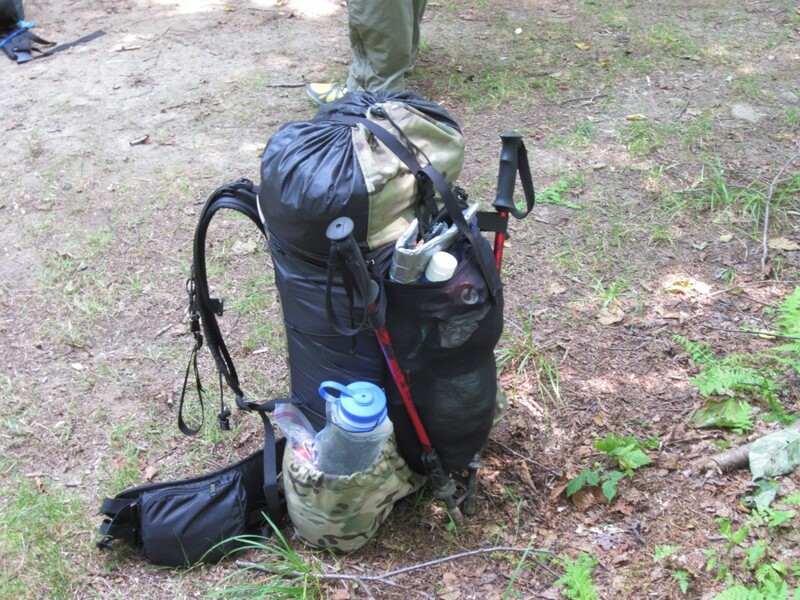 I have carried Granite gear packs for quite few years now. The company has a wonderful reputation and makes a darn comfortable piece of kit in the AC 60. While I still highly recommend their packs for the lightweight crowd, I have most recently become a convert to ULA Equipment. I became the proud owner of a ULA Ohm 2.0, and can honestly say that it instantly became my favorite pack. The Ohm 2.0 weighs in at half of what my AC 60 did, and is great if you are the type who has his or her gear kit dialed in. If you are looking for a lighter alternative to your current pack I recommend giving ULA a look. 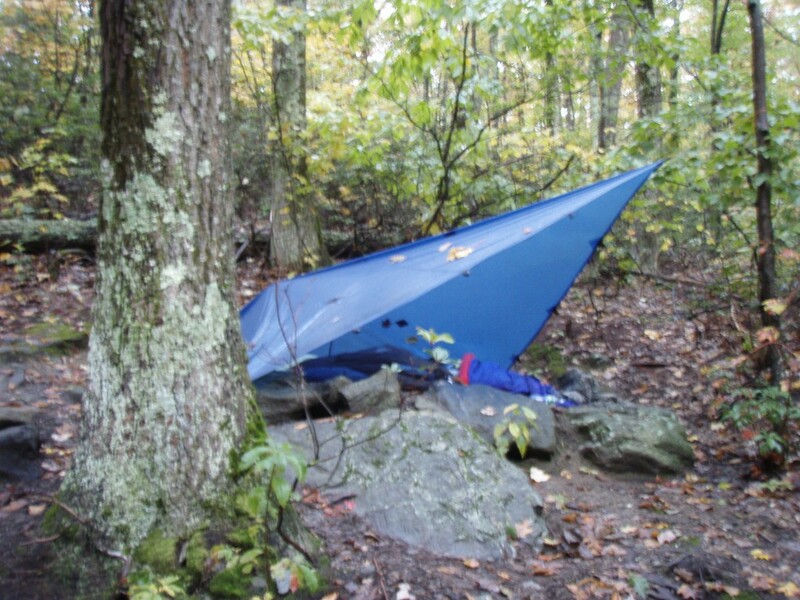 I am a long time tarp user, and for years one of my favorites was the FlatTarp3 by Oware . Dave Olson has a reputation for making quality tarps, and it really shows in the details. Since becoming a bonafide hammock hanger my choice has changed. 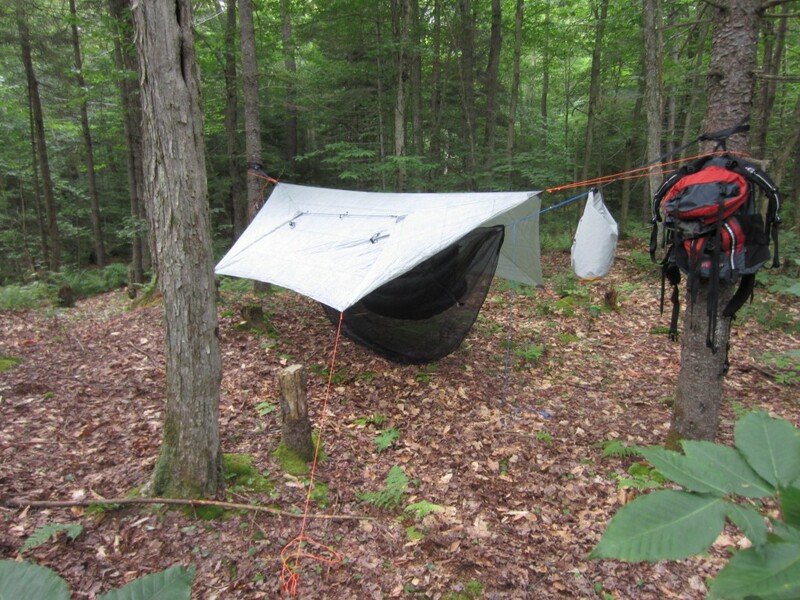 I am a huge fan of the Hammock Gear Standard Cuben Tarp w/ Doors . You’ll hear me gush whenever I mention Hammock Gear, and rightfully so. They’re quality and customer service is second to none. 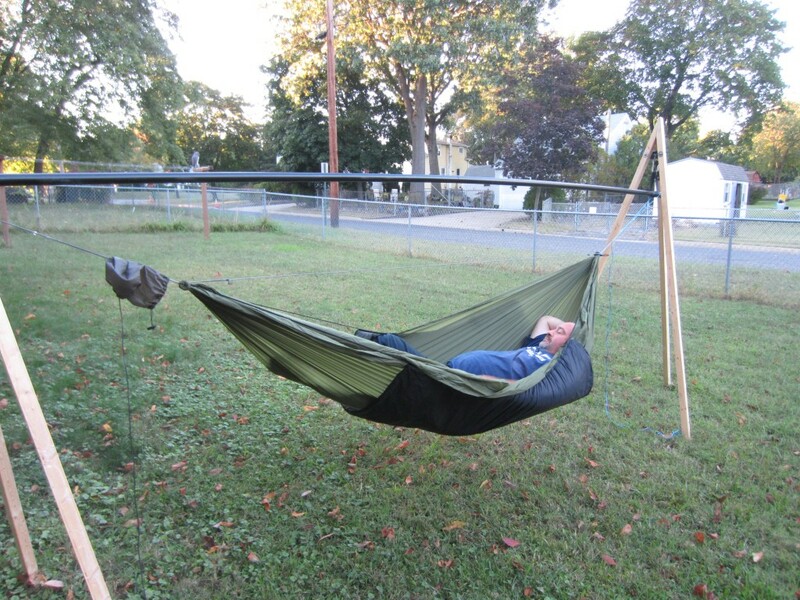 If you are in the market for a hammock, in my honest opinion there is no better brand than Warbonnet. I currently use a Warbonnet Traveler , and their Blackbird is legendary among hangers for comfort, quality, and resale value. 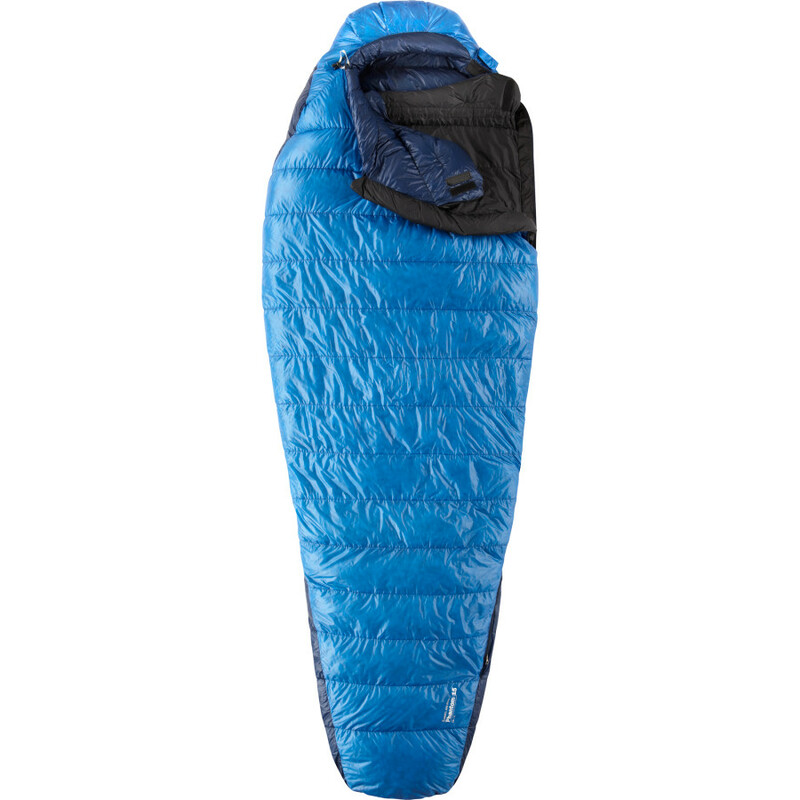 There is nothing more important to me than a good nights sleep on the trail, and for years I have sung the praises of Mountain Hardwear Phantom series sleeping bags. I owned a Phantom 15 and a Phantom 45, and I considered these my most essential pieces of gear for years. 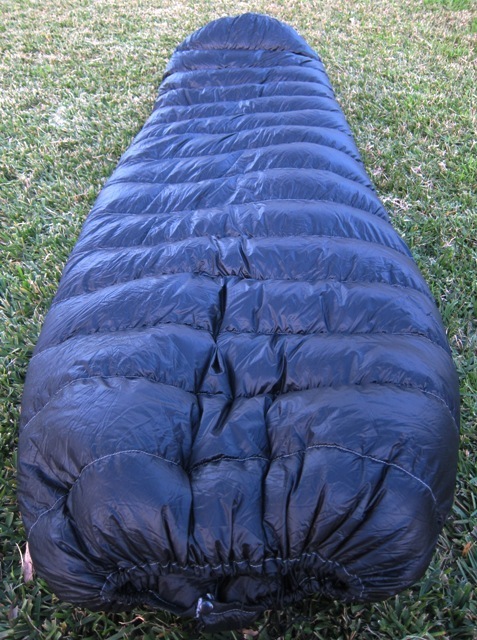 Lately I have said good bye to my old friends and converted to the Hammock Gear Burrow line of top quilts. Now I get top of the line quality in an even lighter package. My Burrow 20 comes in at 17.1 ounces – half of what my Phantom 15 weighed. Combined with my Hammock Gear Incubator 20 under quilt my whole insulation package comes in at the same weight as my old sleeping bag alone! 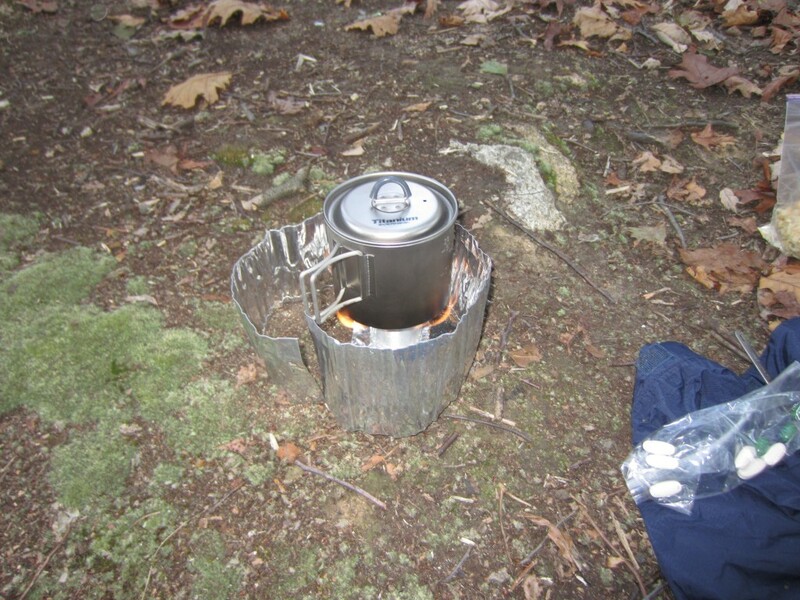 I’ve owned more than my fair share of cookware – titanium, aluminum and stainless. Of all my cookware the piece that gets the most use is my Evernew Titanium 550 ml cookpot. This pot weighs in at 3 ounces even, including lid and stuffsack, and has the capacity I need for most freeze dried meals. On top of that it’s the perfect size to use as a mug. I never (NEVER) go on a hike without my Black Rock Gear Down Beenie . There’s just no reason to leave it home! 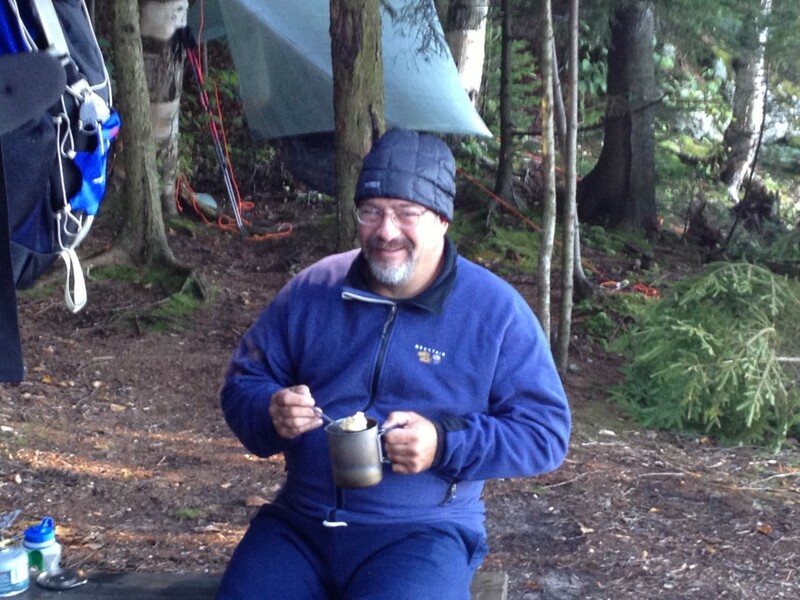 My BRG Down Beenie provides incredible warmth, whether in camp lounging or settling in for a night in the hammock, and weighs in at a scant 9/10’s of an ounce. Unfortunately the only thing it can’t do is make me look cool. Another must have for me is my Smartwool Socks. You’d think merlino wool would be a problem in the summer, but not these socks. My feet are cool in the summer, warm in the winter, and comfortable anytime I wear them. I have a few pair of Adrenelines from 8-10 years ago that are still wearing like iron. 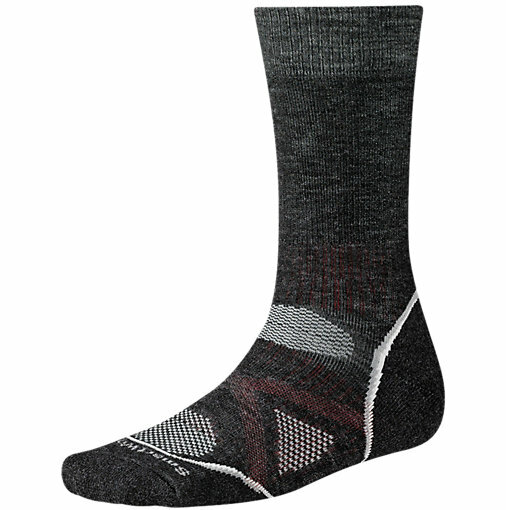 Smartwool socks are a little pricey up front, but you’ll get your money’s worth out of them. ‘Tis the season and Black Friday’s a comin’, so why not treat yourself to some of those goodies you’ve been drooling over? What’s on your wishlist? Paul approached me a while back and said, “What about a trip just for the geezers?”, meaning all of our cohorts in the 40+ age range. Now if you’re over 40 we mean no harm. This was just our tongue in cheek way of saying we’re going on a men’s only trip. Fresh air and fellowship, food for the geezer’s soul. Something within a few hours of home, with some degree of solitude. 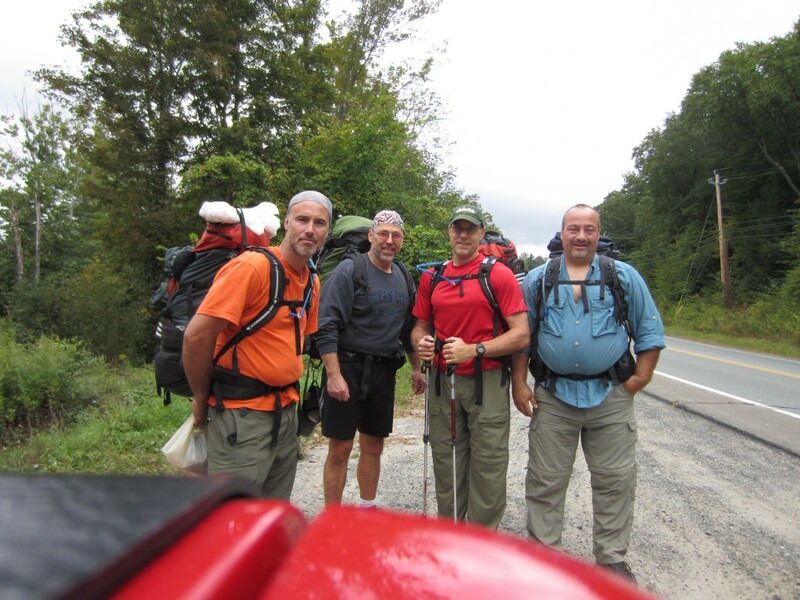 We wanted to do reasonable mileage – not too hard, but not a lollipop hike either. In the planning stages I first thought about Harriman Park in New York, but while I was doing my homework instead came upon the Shawangunk Ridge Trail. This trail seemed to fit the bill – it was 2 1/2 hours from home and it was a ridgeline trail so it should have views. The only real issue was a lack of info. There were no topo maps to be found, so I had no idea of how rugged the terrain was, and I deducted that water was going to be an issue. Because of the unknowns, and the fact that we were looking for a leisurely (or was that geezerly?) stroll, I kept the mileage down to about 5 miles per day. On top of that we were able to cache water at the halfway point, sooooo, problem solved. After hiding water at Ferguson Road we went in search of the trailhead where we were going to leave my truck. I am so spoiled; between the Appalachian Trail and the Adirondacks I’m used to having good trailhead signage. Don’t count on that on the SRT. We spent a good half hour or better looking for the yellow blaze side trail where we were to park. We only found it by God’s grace because the only yellow blaze was 4/10 of a mile down from the trailhead, and Matt and I almost didn’t go that far looking for it. After driving back to our starting point we had a short road walk and then finally, the journey began. We encountered a large blow down about 100 yards in and I thought, “I hope there’s better maintenance than this or this is going to be a long day!!!”. Thankfully, that was the only real blow down we would see all weekend. As we left the road the trail climbed higher and higher, trying to gain the ridge in earnest. Upward we climbed leaving the hardwood behind, until we finally we claimed the ridgetop with it’s covering of scrub oak and blueberry bushes. Somewhere near the top Dave and I were taking a breather and talking when all of a sudden Dave took off running, yelling something like “I gotta get outta here!”. He was standing on a ground nest full of angry yellow jackets and they decided to chase poor Dave down the trail. He got away, but not before getting stung about a dozen times. For whatever reason they never even gave me a look. We wound up taking a long break at an overlook while Dave got sorted out. It was an idyllic spot for a break. There were views of the valley, and we could see gliders riding the clouds after being launched from Wurtsboro airport, climbing the same breezes that were cooling us after our climb up from the road. I haven’t been on a mountain hike in quite some time and this was a nice change of pace. Even so, my lack of conditioning was evident. I wasn’t dying, but I wasn’t leading the pack either. As long as I kept my own pace all was well. A nice walk along the ridge was soon interrupted by a steep dip into a col, followed by a gentle climb back to the ridge. The payback for the effort was another nice view. At some point along the ridge Dave and I caught up to Paul and Matt who were trying get a picture of the biggest porcupine any of us had ever seen. This critter looked like he was 40 pounds and stayed just far enough ahead of us on the trail to avoid our feeble attempts at becoming trail paparazzi. He finally bid us adieu and disappeared into the scrub as we descended into Roosa Gap. Down, down, down, and then finally back up to Ferguson Road. 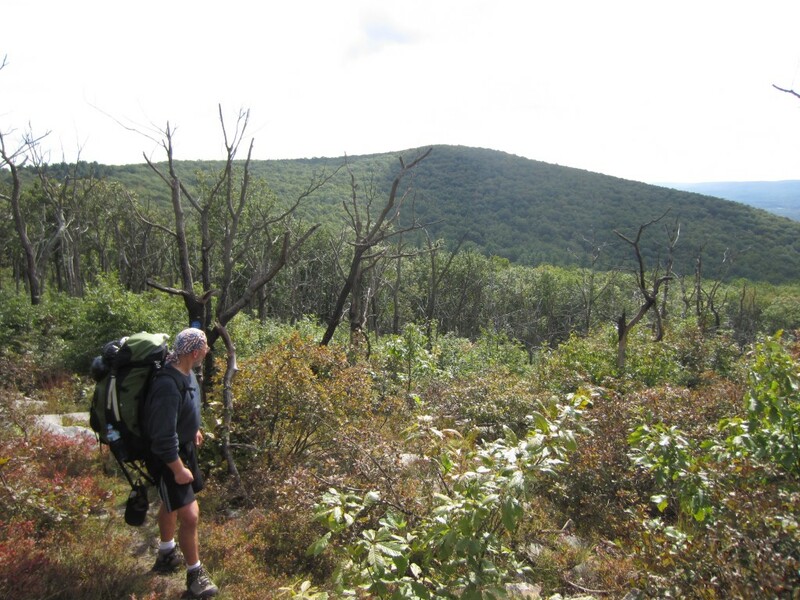 As we recovered our cached water we had a decision – climb up the ridge not knowing if there were any decent campsites, or double back (downhill, no less) to Roosa Gap. The decision became easier after consulting the weather; 100 percent chance of rain with thunderstorms. No one likes to retrace their steps, but fewer still want to be on top of a ridge in a thunderstorm. While Dave pitched his tent the rest of us decided on hanging spots. Paul was spending his first night in his new Warbonnet Blackbird (very nice rig, if I do say so), while Matt was spending his first night hanging in my Hennessey Hammock Expedition Asym. 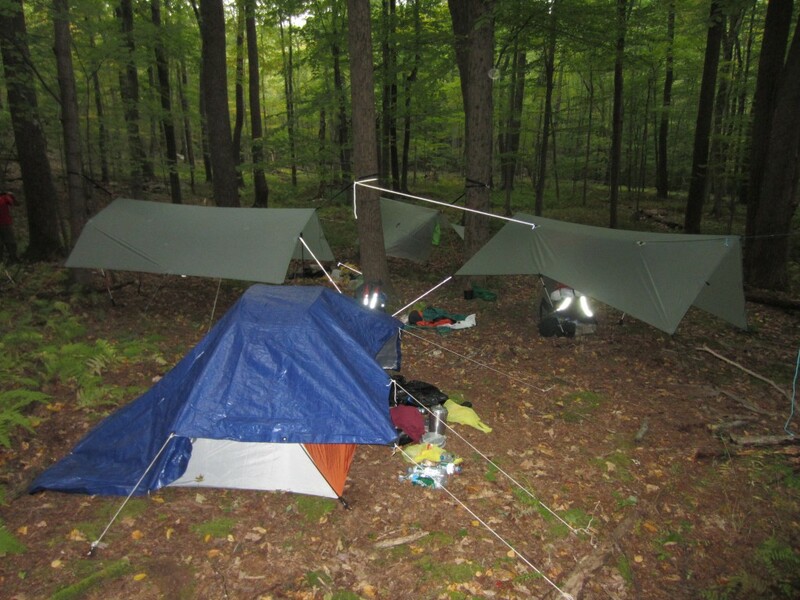 In the meantime I hung my Warbonnet Traveler and cuben Hammock Gear tarp. After dinner Matt got a small fire going to cut the inky blackness, and as we were taking it all in the first drops of rain started. By the time we our hit respective bunks it started to rumble and pour. And pour it did for most of the night. I know I mention it every time, but I love the rain on a tarp. Everyone slept comfortably; even Paul, who is typically an early riser, couldn’t resist the comfort of his hammock. “So, as the Holy Spirit says: “Today, if you hear his voice, as you did in the rebellion, during the time of testing in the wilderness, where your ancestors tested and tried me, though for forty years they saw what I did. That is why I was angry with that generation; I said, ‘Their hearts are always going astray, and they have not known my ways.’ So I declared on oath in my anger, ‘They shall never enter my rest.’ ”. This is an exhortation to be faithful and not harden our hearts. Weary and heavy laden? Jesus promises in Matthew 11:30, “my yoke is easy and my burden is light.”. We can only enter into God’s rest through faithfulness and obedience. After packing up we once again started the climb out of Roosa Gap. The morning was cool and the sun was fighting a losing battle with the clouds. After a mile we reached the ridge top, with it’s cooling winds and awesome views. Once again today would be dominated by a beautiful ridge walk. 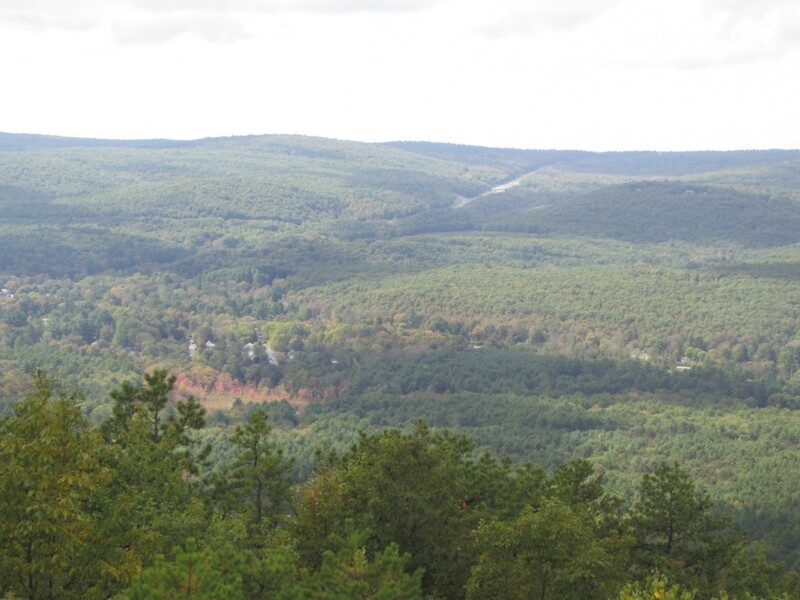 Scrub and blueberry lined trail gave way to the occasional view north toward the Catskills. Once again we dipped into a col, and stopped to snack at the base of an escarpment.The weather had turned decidedly cloudy and as we sat a chill started to settle in. A pack on one’s back does an amazing job of retaining core heat, and we decided to saddled up before we cooled too much. 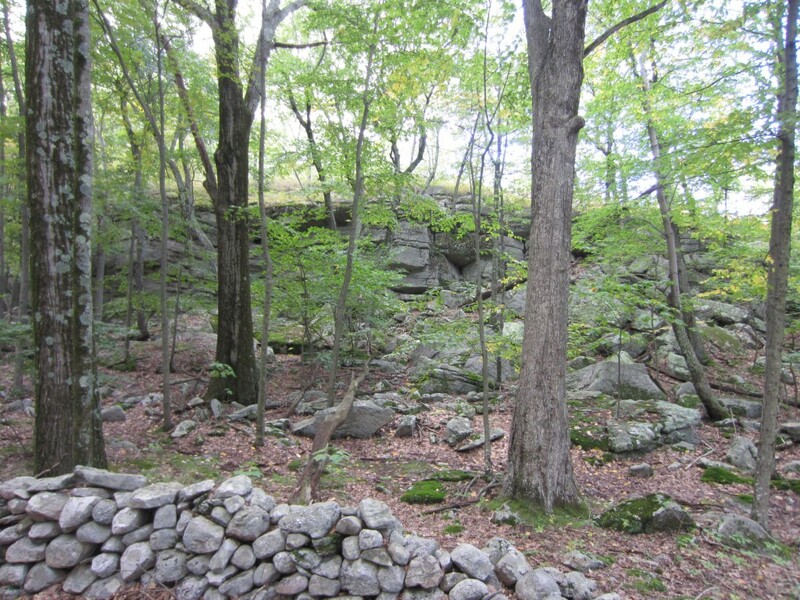 A pleasant walk through hardwoods interspersed with the forgotten remains of old stone walls gave way to a gradual climb to regain the ridge top. At one of the last views we took a break as Dave took care of a cut he received after his foot lodged between two rocks. I won’t go into all the details, but let’s say I might have been a little less sympathetic than I should have been . Dave’s a good sport, evidenced by the fact that he hikes with us. As we started down off the ridge for the last time I remarked to Dave that the trail reminded me of hiking in Maine, and he agreed. 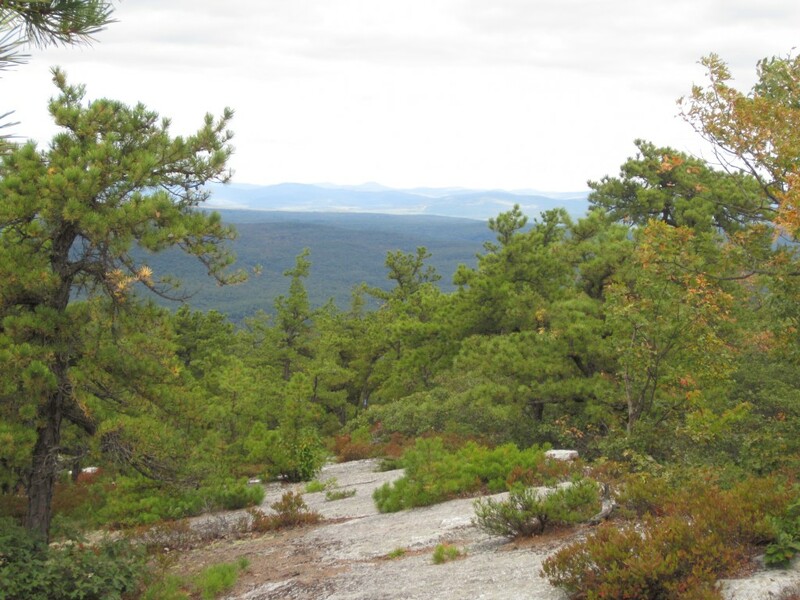 The Appalachian Trail in Maine follows some very similar looking terrain including stunted conifers, and views while walking over canted slabs of bare rock. 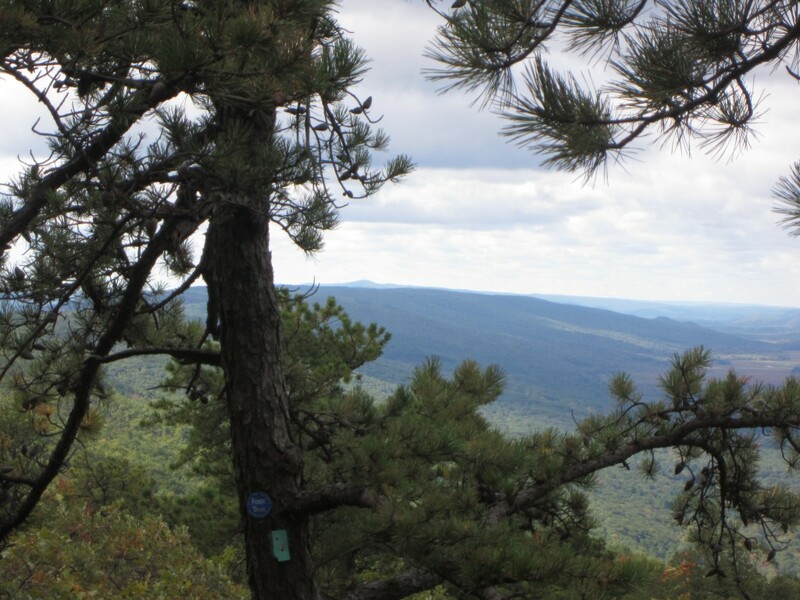 Descending trail with views toward the Catskills Mountains. Down we went, steeper and steeper, until finally we hit bottom at the yellow blazed trail that led to my truck. A short walk to the road and this trip was history. 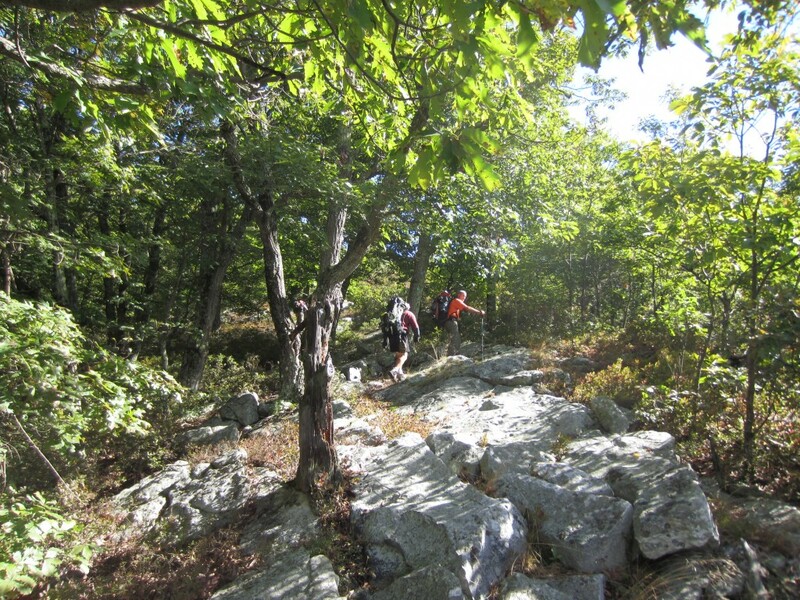 The Shawangunk Ridge Trail turned out to be everything we wanted and more in a geezer hike. The weather was great, the fellowship was sweet, and the challenges were just enough to satisfy that itch to get out.